After a short hiatus Puddles are back with a storm! 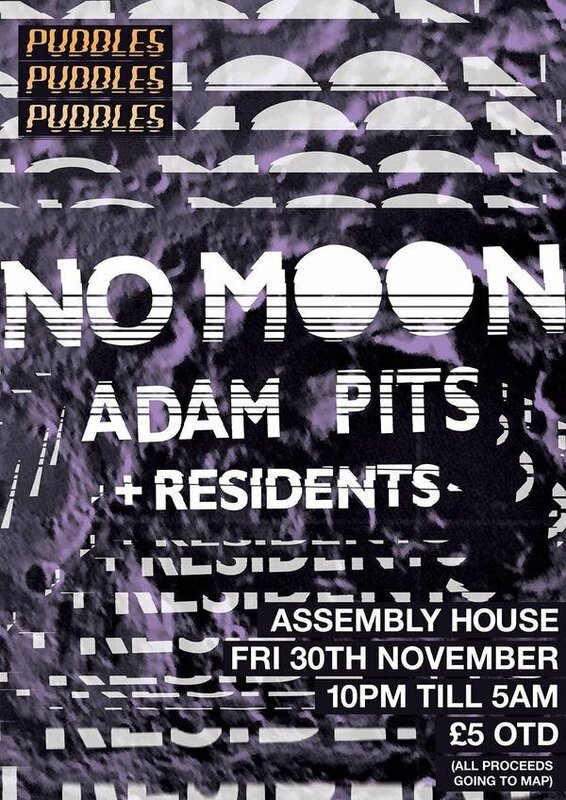 This time around we will be moving things to Assembly House which is a space that has a lot of promising potential for Leeds nightlife. On the night we will be showcasing two local talents that are both doing great things. First up we have Adam Pits. Adam has been working hard over the last few months leading up to his debut EP Socket Power. The London-Leeds musician combines a range of complimentary stylistic elements on a trio of wicked dance floor ready tracks (See below link). We can’t wait to see what he can do behind the decks. Headlining the night will be Manchester’s very own No Moon aka Fred Shepard. Fred has come a long way over the last few years blending a variety of spacey, melodic sounds creating original driving electro rhythms. He has recently been deemed by Red Bull as an artist who is breathing new life into the UK electro scene. Of course support on the night will be provided by Puddles residents and special guest Elliot Walker.